Utagawa Kuniyoshi (1797-1861) Fifty-three Parallels for the Tokaido Road (Tokaido gojusan tsui) Station 36: Goyu, The Thatched Hut of Yamamoto Kansuke,1845-46. Oban. Yamamoto Kansuke (1501 - 1561) was a great general and samurai of the Sengoku period of Japan. He was also one of the celebrated 24 Generals of Takeda Shingen. We see him here as Kuniyoshi imagines him, in domestic comfort, with his mother amid the trappings of the cultured life… the astrolabe in the background (surely a western symbol borrowed by Kuniyoshi), scrolls and the symbols of his courage - arrows - scattered on the floor. He leans on his sword, a reference to the lameness in his leg, and looks at a group of approaching figures, gestured at by his mother. Ominously, birds depart the frame of the picture as snow falls on the trees outside. The figure approaching is the head of the Takeda Clan, Takeda Shingen, a Daimyo who opposed the unstoppable unification by Oda Nobunaga. Kansuke was the strategist at the legendary battles of Kawanakajima where he lost his life in an heroic headlong charge at the opposing troops. Kuniyoshi chooses here to picture the portents of this doomed event in the touching and understated portrait of a man called to arms from the security of his home. The series is fascinating in that it was a collaboration of the three great artists of the day: Kuniyoshi, Hiroshige and Kunisada. The exact number of prints is unknown, but it is assumed currently that they produced 30, 20 and 8 respectively. 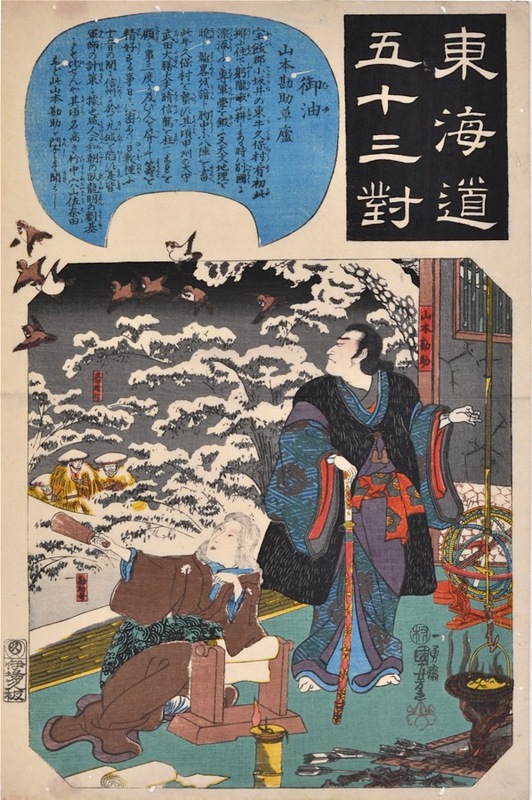 The series is a precursor to one of the very best series of prints of the 19th century, A Comparison of the Ogura One Hundred Poets of 1847 in which the same three artists collaborated on a series celebrating the great Japanese poems. There are many compositional similarities to the two series… the unusual, aberrant cartouches, and the one third, two thirds division of the oban page. Both series were attempts by artists and publishers to circumvent the recently imposed censorship laws for woodblock prints. This is a very nice print by Kuniyoshi from a highly regarded series. There are a few pinholes and the usual centre fold. Otherwise the condition is fine, as is the colour and impression.